Your Corporate Website may be spectacular. Is it producing traffic flow your company needs to thrive? Today's online global market place requires you to be proactive weekly. 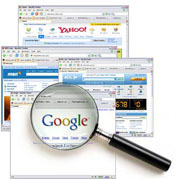 Search engines change requirments often. Every business today needs strong internet exposure encompassing a functional website, Social Media presence promoted by Professional SEO (Search Engine Optimization). OUR MISSION: We get your website listed high on major search engine rankings in your industry. High search engine rankings deliver qualified business leads. We specialize in natural listings. "pay per click" options are available. Why pay search engines for unqualified traffic? Once you stop paying for AD WORDS & PPC your search rankings drop. Organic listings can maintain high ranking levels & traffic flow to your website. A Competitively positioned website in domestic & International markets delivers more qualified leads, more sales. We help your business increase it's online exposure through Business Analytics. World Website Promotions uses several methods: analyzing your website content, keywords & meta tagging, Maximizing Social Media, Strategic linking through blogs specific to your industry. It can take 90 days or less to get your company organically listed on the first page of search engines such as Google, Bing & Yahoo. Once there, You will have techniques to maintain your first page ranking. The proof of our process is to look where we have some of our clients ranked for years. including all majors that deliver qualified traffic. We list your business with the leading global search engines monthly with our direct data base access. You receive monthly listing up-dates on your company submissions with an email written statement on all search engines we list your website with. We include their indexing confirmation as well. 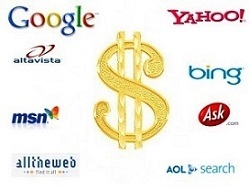 We list your business with the leading feeder global search engines monthly. You receive an email & written statement monthly on all search engines we list your website with. We track your website's position daily & notify you if your # 1 on any search engine such as Bing, Google & Yahoo. You receive a monthly website promotion news letter, giving you inside secrets to get your company listed higher. 3 month agreements, you are not locked into a year obligation. Renewals include a 4th month of search engine promotion from us at no charge. Our fee, a write off against federal taxes under Marketing. If your company does not have a website or you want to up-date the design of your existing website, we will have one built for you. Visit some of our clients business websites.